Firelighting: An overview of methods and materials. I would class kindling as the next step up from tinder. It is the wood that you use to raise the fire from the (short burning) tinder so that eventually you can use larger pieces of fuel. The best kindling is small, dry twigs (soft woods are preferable as they flare up quickly). Those woods that contain resins burn readily and make firelighting easier. The only problem with soft woods is that they burn fast! Make sure you have a plentiful supply to hand, arranged in different 'grades' according to size. I would suggest that the smallest kindling grade be thinner than a matchstick for certain, working up to the thickness of two or so matches. The thinner and smaller the better. I'll say it again, as it is important, go and get some more kindling now before you even think about starting the fire. There is nothing worse than starting a small flame and lacking the fuel to keep it going. 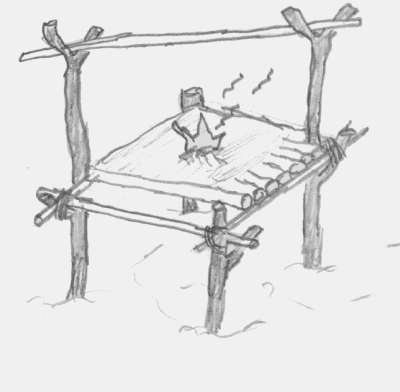 You must use dry wood to start the fire intially. At (almost all) campsites do NOT take any wood from any living tree/bush. Anyway, you do not want this type of wood, you want dry deadwood that has fallen from the trees naturally. Only when the fire is going well can you effectively begin to use wet and green wood. If you cannot snap the twigs/small branches with ease then it is not dead. If it is pliable (easily bends) and looks green (inside and out) then it is still 'living' and no good in the early stage of the fire. As a general rule, the heavier the wood the more heat it will give. Mixing green and dry wood makes a long lasting fire which could be useful if you wanted an overnight fire. 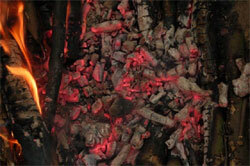 Hard woods - such as hickory, beech or oak burn well, giving off great heat and last for a long time as coals. They will keep a fire going overnight. Soft Woods - These tend to burn fast and can give off sparks. The worst woods for 'sparking' are; cedar, alder, hemlock, spruce, pine, chestnut and willow. Remember that damp wood IS sometimes useful. Damp wood will smoke, and the smoke will keep off flies and mosquitoes. Damp wood will also burn longer so that it 'keeps the fire in'. This is often found in well-drained moorland. Its is soft and springy and may be found exposed on the edges of rocky outcrops. It looks black and fibrous. It can easily be cut into shape and can be stacked like bricks to dry. Once dry it makes excellent fuel. Be careful though, it needs good ventilation when burning. 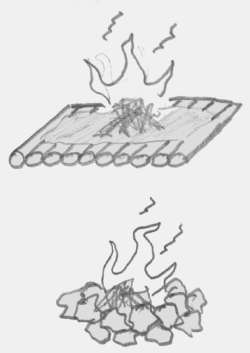 Animal fats (with a wick in the middle especially) can be used in suitable ventilation as a good fire, in particular when used as a stove in a tin can. In the polar regions, animal fat place on a support of bone is sometimes the only available fuel. The webmaster does NOT recommend its use in Scouting. Everyone knows about coal as a fuel. It can actually be found on the surface in certain areas of the globe (for example the northern tundra). Simply to use, just place it on the fire! Oils are generally very combustible. One of the hottest fires possible can be made from a oil and water mixture. Pierce a small hole in the base of a tin can for each liquid and fit a tapered stick into it to govern the flow. The oil and water should run down a trough on to a metal plate. Pulling the stick out increase the flow, pushing it in will reduce the flow. A mixture of 2-3 drops water: 1 drop oil , dropped onto a small fire on the plate will burn almost anything. WARNING: This type of fire can be dangerous. The mixture is highly volatile when heated. The fireplace needs to be prepared carefully. A fireplace is needed to control the fire. If you are not careful the fire can get out of control and become very dangerous. Firstly you will need to decide upon its location. You will need a site that is sheltered, especially during high winds. You will also need to take into account the layout of the rest of the camp (see campsite - layout section for more details). Do not place your fire at the base of tree's, stumps or rocks. Once you have chosen your site, clear the surrounding area to form a wide circle of bare earth (clear all twigs, leaves etc.) around 2m (6 ft ) across. A common fireplace method that is used widely is the temple fire. This consists of a raised platform, built from green timber (or unnatural materials like metal girders!). Simply drive four uprights into the ground and lash crosspieces at the top. Now place a layer of green logs across the top and cover with several inches of earth. You can now light the fire upon this (and has the added bonus of being more comfortable to deal with at waist height). If you make two of the diagonally opposite uprights longer then you can place a piece across joining them to form a simple pot rod or spit. Avoid placing wet rocks or porous rocks near fires. In particular never use those that have been under the water near a fire. They may explode when heated. Avoid slates and softer rocks, and if unsure, test the rocks by banging them together. Do not use any that crack, sound hollow or flake. If the rocks contain any moisture, then as they heat the water expands and can make the stone explode. This will produce flying fragments of stone which will obviously be very dangerous.